Since the company was founded in 1848, Omega has pioneered a huge range of innovations. Britain’s Royal Flying Corps chose Omega watches in 1917 as official timekeepers for its pilots and again in 1940, RAF Pilots watches were supplied by Omega. The 40s also saw the first tourbillon wristwatch and the first of the famous Seamaster watches, whilst the 50s and 60s introduced the legendary Constellation, Speedmaster, Seamaster 300 and Railmaster. Over the years, everyone from John F. Kennedy to Elvis wore Omega watches on official duties. What’s more, in 1962, astronaut Wally Schirra took his Omega Speedmaster to space on NASA’s Mercury Sigma 7 mission, and in 1969 two Speedmasters landed on the moon, worn by Neil Armstrong and Buzz Aldrin. The 18ct Omega Constellation has been Omega’s flagship Chronometer grade automatic dress watch since 1952. It was a development of the Omega highly successful Omega Centenary Chronometer Automatics, 2499 and 2500, launched just a few years previously to coincide with the celebration of Omega’s first 100 years of high-end watch manufacture. In almost new condition, the first class example we see here is from the very top of the Omega Constellation range, from 1970, in 18ct solid gold with an 18ct solid gold ‘linen’ dial. The substantial and heavy 35mm diameter Tonneau watch case is in immaculate condition. As with all Omega Constellations, this watch carries the Constellation motif on the case-back, which is still crisp and hardly worn, indicating this particular watch has led a remarkably charmed life. This watch carries the highly exclusive and desirable 18ct solid gold dial, which is in tip-top, original unrestored condition. This is quite rare and quite special in itself, however this dial, as can be seen, has a highly attractive textured surface often referred to as a ‘linen’ dial, making this a particularly rare example. The specification made this a highly expensive luxury item when new, at the very top of Omega’s price range. Gold baton hour indices around the dial are inlaid with black onyx, matched by the original matt black enamelled gold hands and the original gold centre seconds hand. The dial carries the applied gold OMEGA brand and Constellation name, with ‘Automatic Officially Certified Chronometer’ at 12 o’clock and ‘Swiss Made’ below the ‘6’. Please take a close look at the photos of this fabulous dial. Note – any imperfections you may see are caused by the camera or lighting and are not on the dial. The correct, original specification Omega lens is clear and unscratched having been replaced by ourselves as part of the restoration of this watch. This carries the tiny Omega brand in the very centre of the lens which you may just make out, in one or two of the photographs. This heavy 18ct solid gold case measures 35mm in diameter, excluding the Omega signed crown. This Omega Tonneau case is solid, strong and robust and measures 42mm top to bottom, giving it a good deal of ‘presence’ on the wrist and making it seem much more like a 36mm or 37mm watch. Inside the screw-down case-back, we find all the markings are correct and as expected with The Omega Watch Co. triangle and ‘Swiss Made’, along with 18K-0.750 Geneva hallmarks. The case-back carries the Omega model reference numbers 168009 and 168017. The rear of one of the lugs also bears a Swiss 18ct hallmark. The case has been cleaned, carefully inspected and very lightly hand-polished, as this was all that was required to bring it back to its current tip-top condition, with no scratches dings or marks of any kind visible to the naked eye. The case-back carries the famous Constellation motif which is almost as new. Being 18ct gold, this is usually worn to a greater or lesser extent, but here it is still crisp and distinct, indicating this watch has hardly been worn. The screw-down case-back and sealed crown make this watch water resistant to 30 metres*. *Although originally specified as Water Resistant to 30 metres, this has not been tested and is not guaranteed. As always, our standard advice applies: Vintage watches should be kept clean and dry at all times. This is the very high grade, ‘Officially Certified Chronometer’, Omega Calibre 564 automatic, copper-plated beryllium-bronze, 24 jewels movement. As can be seen, it is in absolute tip-top sparkling condition. The movement has been fully overhauled by our vintage Omega specialist watchmaker. This means disassembling the watch movement down to all its component parts, careful inspection under high magnification, replacement where necessary with only genuine Omega parts, then careful reassembly and adjustment before final calibration. This watch, therefore, winds, sets and runs perfectly accurately and reliably within +5 seconds per day, averaged over 5 positions. This is no exaggeration, we have checked and confirmed these test results on our electronic watch timegrapher. Please bear in mind, this kind of performance is outstanding for any watch, particularly of this age. The movement also has a 46 hour power reserve when fully wound. We are therefore highly confident in offering 12 months’ warranty with this watch movement*. The movement is signed Omega Watch Co Swiss, Twenty Four Jewels, and Cal. 564 Adjusted 5 Positions with the serial number 32974671, which dates the watch to 1970. These watches are well known for their exceedingly robust, accurate and reliable movements making this watch perfect for everyday use or simply as evening wear only – as you wish. The automatic winding mechanism is very efficient and if worn regularly each day, this watch will never need winding and seldom need resetting. The movement winds, runs and sets smoothly and is working perfectly. The watch is complimented with a very high quality Black leather strap and gold plated Omega buckle, which we feel really suits this watch. However, if you have a preference for another colour or style, please let us know and we will do our best to supply and fit your preferred strap for no extra charge. (If a new Omega strap is preferred, this can be fitted for an extra £90.00) We carry tan, conker, dark brown and black in stock, in plain padded leather, crocodile skin or lizard skin, but we can also obtain most types and colours at short notice. Although there are no original papers with this watch, all the numbers and markings on the watch are correct, dating the watch to 1970. A detailed written receipt with 12 months’ warranty and a separate insurance valuation for the replacement value of this watch will be provided at the time of sale, along with our unique ‘Lifetime Authenticity Guarantee’ which states: “If at any time, this watch proves to be anything less than totally authentic, or not as described, Vintage Gold Watches of London will offer you a full refund at any time”. The matching vintage Omega presentation box shown in the photographs is included in the sale. This is a simply stunning example of a top of the range, 18ct Omega Constellation in immaculate condition. 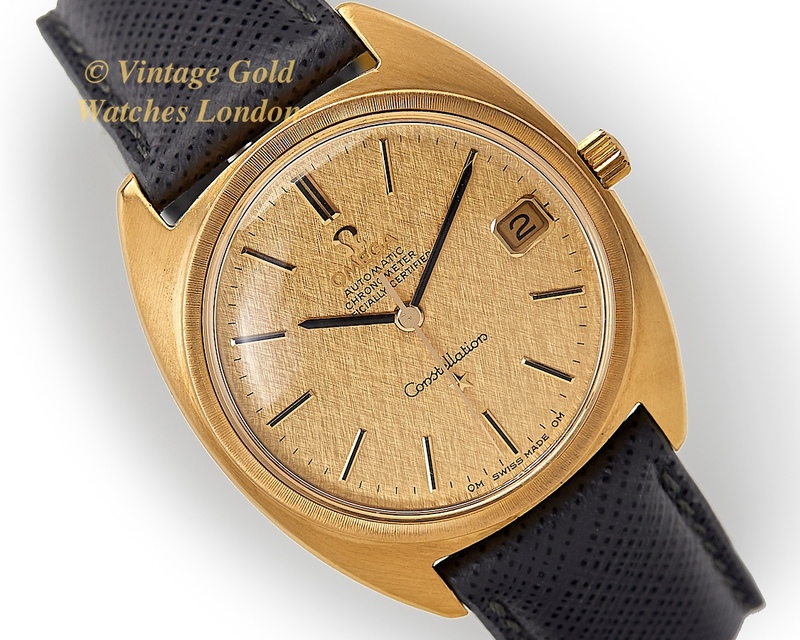 If you are looking for a classic 1970s Omega Constellation with one of Omega’s very best automatic movements, in top condition and with a SOLID GOLD DIAL, this watch ticks all the boxes. The movement is of a very high grade and an equal to watches much more expensive than this. Indeed when new, this watch would have cost more than the equivalent gold Rolex Oyster Perpetual. Omega Constellation watches are highly collectable and the desirability of this watch means its value will always remain strong. In addition to being perfectly practical for everyday use, this watch will make an excellent investment and heirloom piece, as well as be something wonderful to wear, treasure and enjoy! Even though vintage gold Omega watch prices continue to climb, we still feel sure that top class examples are underpriced. This is because as time passes and the world market for vintage gold Omega watches continues to grow, the finite supply means prices will inevitably climb ever higher. We promise you will be so pleased you bought this watch! We are happy to accept PayPal as this is the quickest method of payment. However, if you would like to pay by bank transfer, we will be pleased to pass on a 3% transaction saving to you. Similarly, if you wish to pay by International SWIFT or International Bank Wire Transfer, we will provide you with our BIC / Swift number and our IBAN number. We will be happy to Service your watch, Repair your watch or Restore your watch. All at ‘sensible’ prices. Please see here. We are here, ready, available and awaiting your call! We will be happy to answer any questions and offer advice about this or any of our watches listed for sale. If you would like some general advice regarding any aspect of vintage watches, including buying, selling, or collecting vintage watches, we will also be happy to hear from you.